Yin Chiao Tablet is an efficacious remedy for colds and influenza – the best of its kind manufactured in China. It is prepared in the form of tablet by means of scientific methods and has become a household medicine without side effects. common cold Use for early stage of common cold or flu with symptoms of sore throat, low fever, thirst, aching shoulders and neck, bodily pains, headache, swollen glands, or dry cough. Colds or influenza is a disease that people are apt to be attacked. When weather is uncertain with constant changes in temperature, people are liable to colds due to over-fatigue, insufficient rest, lack of bodily resistance, etc. When infected, in mild cases, they will sniffle, sneeze, cough, snivel and feel feeble. In severe cases, they will also have a headache, fever, etc. Though not a serious disease, colds or influenza is detrimental to health and affects work, and especially when influenza is in serious conditions. The complication such as bronchitis, pneumonia is likely to be caused. This is an effective medicine when used within the first twelve to twenty four hours of the earliest symptoms of sore throat or general aching. The herbs Lonicera and Forsythis are specific for treating upper respiratory viruses; arctium addresses sore throat. Because of the opportunism of respiratory viruses, this product is also used in early stage pathogenic wind cold to good effect. Once the viral pathogen works its way into the interior with more pronounced symptoms, switch to Gan Mao Ling for more severe symptoms of the cold and flu. The Yin Chiao formula is most useful in early stages of the common cold or flu. There is also a non-sugar coated version called Yin Chiao Chieh Tu Pien. Yin Chiao Tablet is prepared from herbs in accordance with prescriptions of Dr. Wu Chu-tung, a noted expert in medical science of Ching Dynasty. 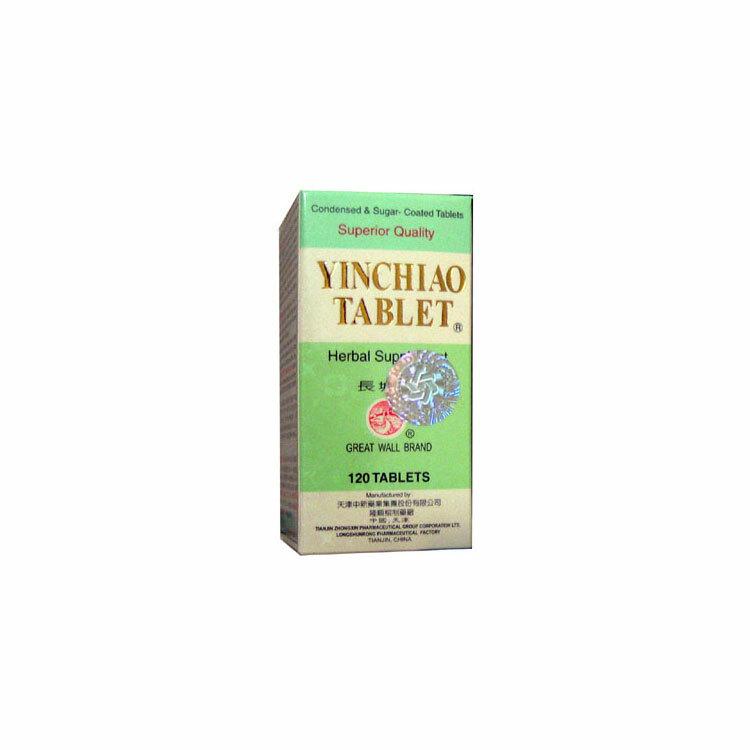 Yin Chiao Tablet is antidotal. Carminative and tranquilizing, good for inflammation and cough. 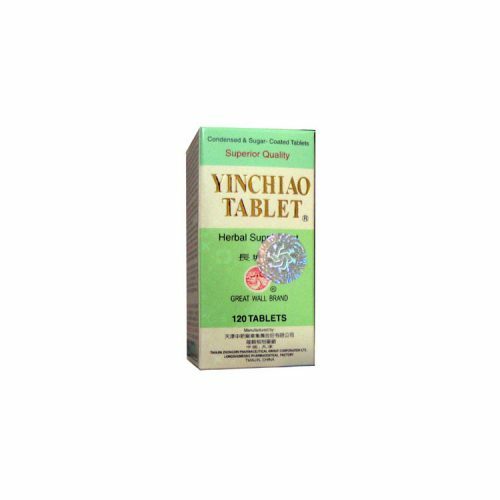 It has been proved in a good number of cases that Yin Chiao Tablet is an efficacious remedy for colds and influenza – the best of its kind manufactured in China. It is prepared in the form of tablet by means of scientific methods and has become a household medicine without side effects. Dispels pathogenic wind, clears heat, resolves toxin, benefits the throat, relieves thirst, diffuses lung Qi. Expel Wind-Heat, antidotal, carminative. Use for early stage of common cold or flu with symptoms of sore throat, low fever, thirst, aching shoulders and neck, bodily pains, headache, swollen glands, or dry cough. Helpful for pediatric ear infection, acute bronchitis, tonsillitis, pneumonia, pharyngitis, otitis media, parotitis, measles,and influenza. Also useful in early presentations of childhood viral diseases, including chicken pox, rubella and measles. May have beneficial effects in hives or skin itching with heat. Adults, take 3 to 5 tablets, 2 to 3 times a day with warm water.